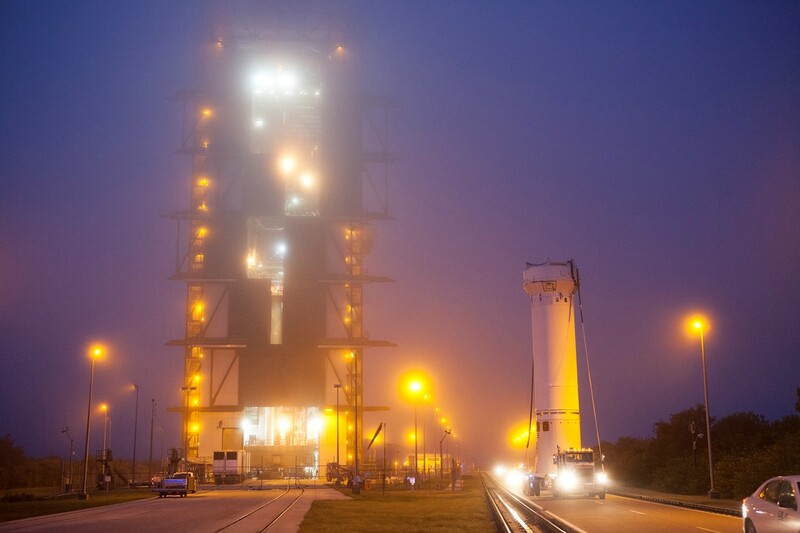 An Atlas V 421 launch vehicle made its way to the launch pad at Space Launch Complex 41 of Cape Canaveral Air Force Station on Thursday in preparation for an early morning liftoff on Friday. 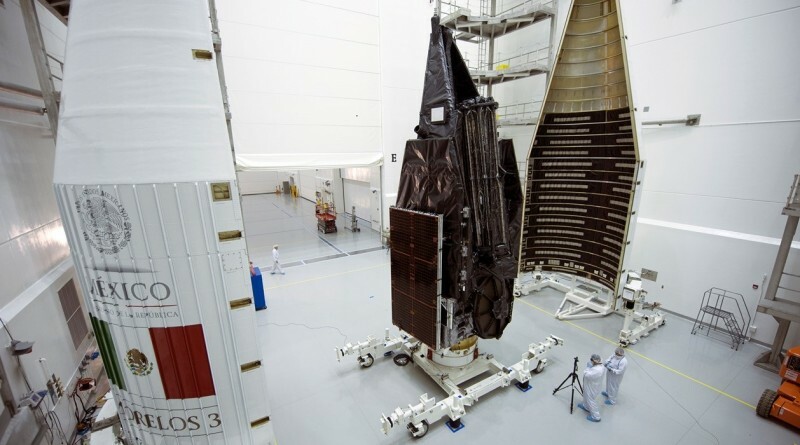 As rare commercial launch of the Atlas V lofting the Morelos 3 satellite for Mexico, this mission is contracted through Lockheed Martin Commercial Launch. Liftoff is planned at 10:08 UTC, the opening of a 20-minute launch window, to mark the start of a climb into a Geostationary Transfer Orbit for spacecraft separation almost three hours after launch. This will be the 100th launch under the operation of United Launch Alliance since the company’s birth in 2006 in a merger between aerospace giants Lockheed Martin and Boeing to cut redundancy in competing rocket lines, unite a powerful workforce and cut the cost for reliable access to space. ULA raked up some impressive numbers over its nine-year existence, launching on average one mission per month with plenty to look back at – including exciting science missions to Mars and Jupiter, important missions flown in support of flagship satellite programs such as the Global Positioning System, a number of commercial launches and a variety of satellites lofted for the military and other government agencies. All in all, United Launch Alliance launched an estimated $80 billion of real estate into space, reaching everything from Low Earth Orbit to Interplanetary Trajectories with 28 Delta II, 23 Delta IV and 48 Atlas V launches – keeping an almost spotless track record, justifying the price tags of ULA’s rockets. Said prices have so far been the reason for a dominance of government missions in ULA’s launch manifest and only occasional commercial flights. The launch contract for Morelos 3 was signed in 2013 as the first commercial customer for Atlas V in years – likely as the result of a combination of factors including the struggle of the Proton-M with its reliability record, the booked manifests of Ariane 5 and Falcon 9 and a cut of Atlas V prices that had been advertised by Lockheed Martin. 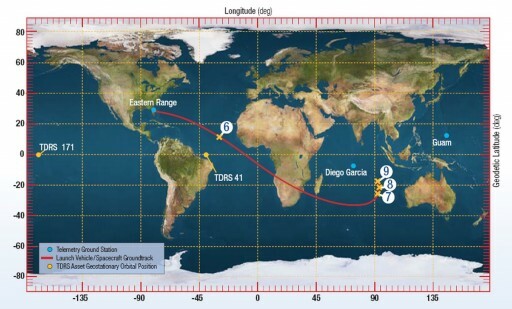 The decision to switch Morelos 3 from an original plan of launching on an ILS Proton to the Atlas V paid off even before liftoff because the MexSat-1 satellite, the twin to Morelos 3, was lost when its Proton-M rocket crashed after a third stage failure back in May. This launch failure put the pressure on Morelos 3 to get into orbit to be able to join the smaller Bicentario satellite to deliver an operational communications capability to the government and private sectors in Mexico. Atlas V is the satellite’s best bet for a smooth ride into orbit to enable two of the planned three-satellite constellation to take up station over Mexico. 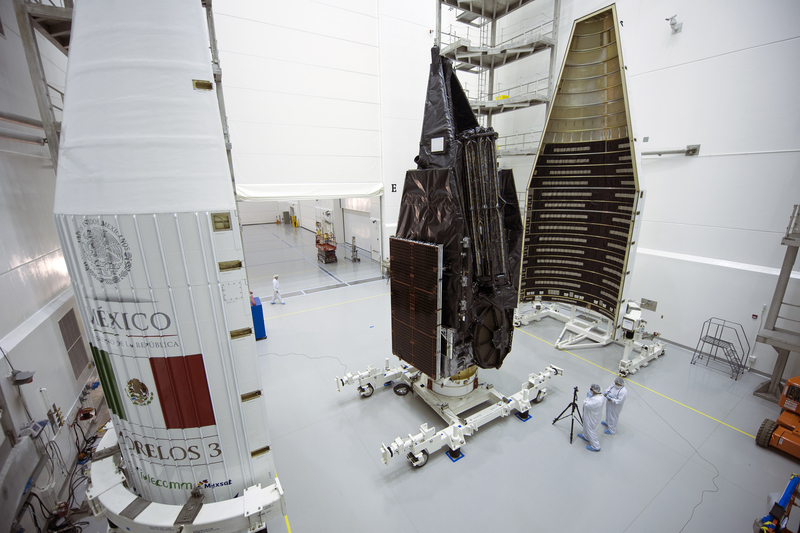 Boeing finished assembly of Morelos 3 in June 2014 and the satellite remained in storage until its mid 2015 delivery to the launch site for final processing at the Astrotech Facility in Titusville where the spacecraft was fueled for flight and went through its final set of testing activities followed by the encapsulation in the protective payload fairing. The Morelos 3 satellite took its place atop the Atlas V rocket last Friday after the 421 rocket had been assembled in the weeks ahead, consisting of the Atlas V Common Core Booster that hosts two Solid Rocket Boosters for extra thrust and the Centaur upper stage sitting atop, tasked with two main engine burns. 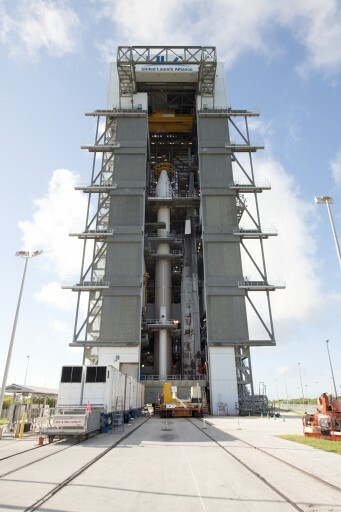 All set for its pre-sunrise liftoff on Friday, Atlas V received the official approval to head into launch operations by the Launch Readiness Review that awarded a clean bill of health to the launch vehicle and all other support systems needed for the mission. At 5 p.m. local time on Thursday, the 58-meter tall Atlas V emerged from its Vehicle Integration Facility for a 30-minute trip to the pad. Moved to the pad by two trackmobiles, the Mobile Launch Platform was carefully centered on the pad to allow teams to connect power, data, propellant, pressurant and purge umbilicals as part of the setup for countdown operations. The trackmobiles will be pulled free later on Thursday and Atlas V will complete fuel loading on its first stage, receiving 94,600 liters of refined Kerosene. As the sun sets at the Space Coast, Atlas V will be illuminated atop its launch pad as it awaits the initiation of its countdown around 11 p.m. local time in a shortened roll-out-to-launch campaign. Meteorologists are predicting a 70% chance of favorable weather conditions during the 20-minute window. Tropical Storm Joaquin has been keeping some distance to the Cape so far, however, its effects will be felt on launch day in the form of high ground winds that may become a concern as well as possible thunderstorms in the evening hours. Solar weather is also a factor as a sunspot group with the potential of sending out space-weather-effective flares is closely monitored. Winds and solar weather remain the primary concerns for the backup launch opportunity on Saturday with a 60% chance of cooperative weather that day. Atlas V countdown operations will begin 7 hours ahead of the opening of the launch window that extends from 10:08 to 10:28 UTC on Friday. Prior to the countdown, technicians will already be busy at the pad, completing final hands-on work and closing out the Vertical Integration Facility, pad facilities and the Atlas V launcher. The first step completed at T-6 Hours 20 Minutes is the activation of the Atlas V rocket. Following the activation of the launcher, teams begin a series of checkouts of the electrical system of the rocket. Meanwhile, at the launch pad, technicians complete final hands-on work, closing out the rocket and the various facilities on the ground. While that is in progress, the Launch Team puts the Atlas V through a series of communications checks on its S- and C-Band Systems in addition to other tests. Flight Termination System testing is also completed and the Nitrogen Purge flow on the vehicle is initiated. By L-3 hours, the launch pad is cleared by all personnel. At T-2 Hours, the countdown enters a built-in hold during which teams perform the fueling pre-task briefing and the GO/No GO Poll for propellant loading. As soon as the countdown resumes at T-2 Hours, propellant loading operations start. The complex procedure to load the two stages of the rocket with cryogenics begins with the chilldown of ground support equipment and transfer lines and tanks chilldown on the Liquid Oxygen side. Liquid Oxygen starts flowing into the Centaur upper stage tanks shortly thereafter. Centaur LOX loading takes about 40 minutes as 15,700 liters of –183-degree Celsius oxidizer are filled into the upper stage. Once Centaur is into propellant loading, the large Liquid Oxygen tank of the Common Core Booster also starts fueling. LOX load on the CCB also moves through the three steps, slow-fill, fast-fill and topping. The Common Core Booster is loaded with Rocket Propellant 1 (refined Kerosene) ahead of the launch countdown. The large Common Core Booster stands 32.46 meters tall with a diameter of 3.81m and a fuel load of 185,500 liters of LOX and 94,600 liters of RP-1. The final tank to be loaded during the countdown is the Liquid Hydrogen Tank of the upper stage that also goes through the usual steps. Centaur is loaded with a total of 48,100 liters of -253-degree Celsius LH2 fuel. Centaur is 12.68 meters tall and 3.05 meters in diameter. When clocks reach T-4 Minutes, the countdown enters its final built-in hold. This hold can be extended in case of technical issues or uncooperative weather. During the hold, the launch team receives a final weather briefing and performs the GO/No GO Poll for the Terminal Countdown. As clocks start ticking down from T-4 Minutes, final vehicle configurations such as ordnance arming, flight termination system arming, propellant tank pressurization, transfer to internal power, and flight control system reconfigurations will be made as part of the Automated Sequence to place the vehicle in its launch configuration. At T-2.7 seconds, the massive two-chamber RD-180 main engine of the Common Core Booster ignites and soars up to its full liftoff thrust of 390,250 Kilograms. Engine start-up is closely monitored by flight computers to make sure it reaches operational conditions before the launcher is committed to flight. When clocks hit zero, Atlas V ignites its two Solid Rocket Motors to achieve a total liftoff thrust of 734,650 Kilogram-force, jumping off its pad with a thrust to weight ratio of 1.7. Balancing through the thrust vector control of its RD-180 engine, Atlas V will climb vertically until clearing the pad before starting its pitch and yaw maneuver not six seconds into flight to begin heading to the south-east, departing Cape Canaveral on a launch azimuth of 104 degrees – the standard route for Geostationary Launches from Florida. 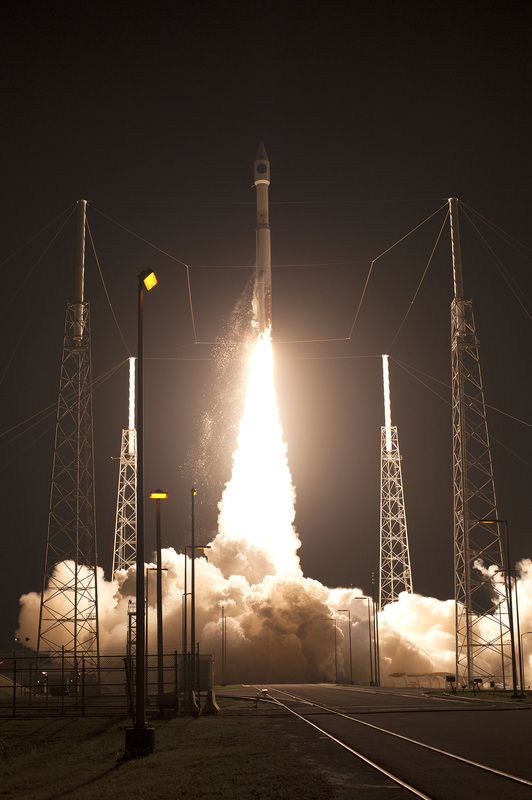 Heading into the dawn, Atlas V will align itself with its planned ascent trajectory, thundering uphill with its main engine and boosters firing at full throttle, burning 2,020 Kilograms of propellant each second of powered flight. Atlas V will pass Mach 1 just 47 seconds after liftoff with Maximum Dynamic Pressure being encountered 59 seconds after launch. The RD-180 main engine will throttle back at MaxQ for a brief moment to limit stress on the vehicle. The twin Solid Rocket Motors will burn until T+94 seconds, when thrust on the SRMs will tail off after they did their job of providing additional thrust for the initial phase of the flight. The vehicle will hold the SRMs for an additional 32 seconds to ensure a safe off-shore impact away from any marine traffic or populated areas. Separation of the SRMs at T+2 minutes and 7 seconds is accomplished by using pyrotechnics. Leaving the boosters behind, Atlas V will be powered by its two-chamber RD-180 engine alone, burning 1,150 Kilograms of propellant per second to generate a thrust of 415,200 Kilogram-force when flying in the upper reaches of the atmosphere. While the first stage is burning, the Centaur upper stage will prepare for its burn by starting the in-flight chilldown of the RL-10C engine and firing a pyro valve to initiate the pressurization of the hydrazine attitude control system of Centaur. Prior to hitting four minutes in the flight, the main engine will begin a gradual throttle-back to limit acceleration on the launch vehicle to 5Gs as the rocket gets lighter and lighter, approaching the shutdown of its first stage. Cutoff of the RD-180 is expected four minutes and nine seconds after blastoff. Six seconds after BECO, the pyrotechnic stage separation system is fired and the Common Core Booster ignites eight small retrorockets that push the spent stage away from Centaur. Immediately after separation, Centaur purges its attitude control system with nitrogen before pre-starting on LOX and LH2 followed by the ignition of the RL-10C engine at T+4 minutes and 25 seconds. RL-10C delivers a thrust of 10,800 Kilogram-force and is capable of re-igniting which will be used later in the mission. Eight seconds into the burn of Centaur, Atlas V will jettison its protective payload fairing, initiating charges to separate the two fairing halves that then rotate outward on hinges before separating altogether, a process that ensures no inadvertent contact with the payload occurs at fairing separation. With the fairing gone, Centaur will continue burning its engine, the first burn being 13 minutes and 44 seconds in duration targeting an elliptical Parking Orbit at an inclination of 27 degrees. Shutdown of Centaur is expected at T+18:09. Shutting down the engine over the Atlantic, the vehicle will be about halfway between Florida and Africa on its ground track, entering a long coast phase of two hours and 30 minutes. This coast allows the stack to climb up to a position in its orbit where the second burn can raise the apogee to Geostationary Altitude while also putting a few Kilometers on the perigee. During the coast phase, the stack performs a PTC Roll to evenly distribute sun exposure on the vehicle and Centaur performs regular RCS thermal conditioning firings. In its orbit, the stack will make a pass over the southern countries of Africa, heading out south of Madagascar for a lengthy pass over the Indian Ocean. The second burn will be just 52 seconds in duration beginning two hours, 48 minutes and 9 seconds into the flight, targeting an insertion orbit of 4,738 by 35,786 Kilometers at an inclination of 27.0 degrees. Separation of the Morelos 3 spacecraft is expected two hours and 51 minutes after liftoff. Centaur will finish its mission with the standard Contamination and Collision Avoidance Maneuver while Morelos 3 begins communicating with ground stations to begin several days of orbit-raising ahead of the deployment of its two large solar arrays and antenna reflectors to be able to head into a testing campaign before entering service. 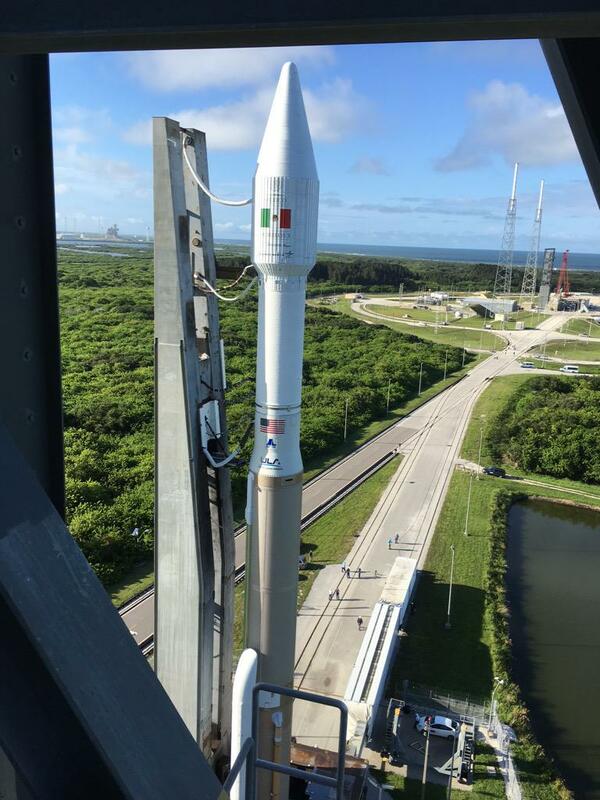 Copyright © 2019 Atlas V – Morelos 3 – Spaceflight101. All rights reserved.